Shelly Sterling meets with the media outside the courthouse in Los Angeles on July 28, 2014, after a California judge gave the go-ahead to the $2 billion sale of the Los Angeles Clippers to former Microsoft chief executive Steve Ballmer, ruling that embattled owner Donald Sterling could not block the move. Donald Sterling’s estranged wife, Shelly Sterling, won a landslide victory in court on Monday as a judge ruled in her favor, making way for the sale of the Los Angeles Clippers to former Microsoft CEO Steve Ballmer, the Los Angeles Times reports. Judge Michael Levanas effectively dismissed all of the embattled Clippers owner’s arguments, agreeing with Shelly Sterling on all three counts in a tentative oral ruling, according to the news site. 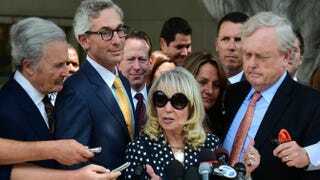 In the ruling, Shelly Sterling was also granted permission to complete the sale even if an appellate court intervenes. “Ballmer paid an amazing price that cannot be explained by the market,” Levanas said, according to the Times. The business mogul coughed up an astonishing $2 billion for the team. The National Basketball Association is also happy with the outcome. “We are pleased that the court has affirmed Shelly Sterling’s right to sell the Los Angeles Clippers to Steve Ballmer. We look forward to the transaction closing as soon as possible,” it said in a statement.